RDs share their favorite recipes that everyone can enjoy this holiday season and beyond. 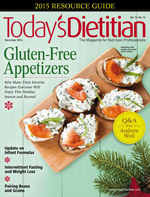 Today's Dietitian sits down with acclaimed nutrition and health guru Andrew Weil, MD, who shares his vision for dietitians' role in public health. Over the years, manufacturers have introduced new, innovative varieties and categories. Learn what's available and how to help clients and patients choose what's best for their babies. Intermittent Fasting — The Key to Long-Term Weight Loss? Some believe it's another fad diet, while others view it as a plausible method for shedding unwanted pounds. This continuing education course reviews the effects of substance abuse as they relate to nutrition and health, and addresses the role RDs play during treatment to correct nutrition-related deficiencies, address resulting health disparities, and improve the lives of addicts by providing tools for lasting recovery. With so much confusion surrounding sodium recommendations, experts discuss what dietitians and other health professionals should be advising their clients and patients to do. Today's Dietitian spoke with experts to examine the evolving research on the link between saturated fat and cardiovascular disease. Researchers have developed new mathematical formulas RDs can use to more accurately predict the rate of weight loss in patients. 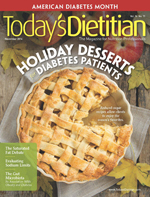 Dietitians offer strategies clients and patients can use to enjoy their favorite sweets of the season. 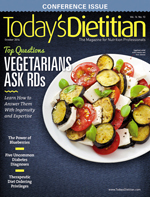 Today’s Dietitian provides evidence-based answers to some of the most common questions clients and patients ask nutrition professionals about a vegetarian eating pattern. A review of their underlying pathology, how they’re diagnosed and classified, and strategies for nutrition intervention. Evidence shows this fruit is jam-packed with antioxidants and phytochemicals that may help prevent and slow the progression of chronic diseases. Find out what the Centers for Medicare and Medicaid Services final rule says, to whom it applies, and what RDs and other nutrition professionals think about it. Here are some tips and ideas for helping clients make the most of the season’s bounty. Experts provide guidance on vitamin D supplementation for older adults based on the American Geriatrics Society Consensus Report. This continuing education course reviews the current research on the associations between academic performance and nutrition, specifically breakfast frequency and composition, sugar-sweetened beverage consumption, fruit and vegetable intake, and diet quality. From amaranth to quinoa, they offer a wealth of nutrients and can add much-needed variety to your clients’ and patients’ diets. While there are many other factors that contribute to the development of cardiovascular disease, the good news is a nutritious diet can help maintain a clear, flexible, healthy circulatory system. Transitioning from paper charts to EMRs can facilitate patient visits and help you run your practice more efficiently. Although it lacks a standardized clinical definition, the frailty of older adults demands special considerations in terms of treatment and nutritional needs. Here’s a review of the new options on the market plus cooking tips for delicious homemade meals. If you’re headed to the Food & Nutrition Conference & Expo next month, get ready to discover Atlanta’s intriguing dining scene. 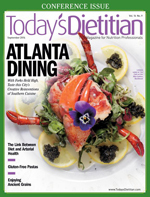 Today’s Dietitian asked some of Atlanta’s top food experts to weigh in on what’s hot in the city’s food scene. This continuing education course reviews inflammation’s impact on most chronic disease states, curcumin’s potential role in preventing and treating these diseases, curcumin’s main mechanisms of action, and evidence-based recommendations for dietary intake of curcumin that RDs can provide to their clients. 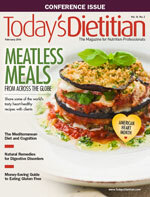 Nutrition professionals review US News & World Report’s highest-ranked diets for clients and patients. Many fast-food chains are offering gluten-free menus, but there are some important things clients and patients must know before chowing down. Here’s a review of the benefits of probiotics, the top sources, and what’s new in the dairy case. RDs discuss what it takes to get started, how to set goals, and the importance of choosing a specialty for long-term success. This continuing education course focuses on cancer survivors’ nutrition-related issues following the conclusion of active cancer treatment. 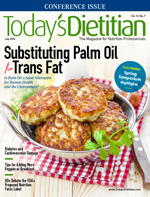 The FDA’s proposal to ban trans fat has increased demand for palm oil, but is palm oil a good alternative for human health and the environment? Experts discuss oxidative stress and whether antioxidants may play a role in protecting cardiovascular health. Attendees raved about the conference, calling it a huge success. 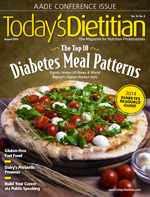 Today’s Dietitian profiles the top health systems in the country that are driving change. The most important meal of the day provides clients and patients with the perfect opportunity to eat more vegetables and meet dietary requirements. Dietitians speak out about the FDA’s proposed changes, what more should be done, and how the updates will impact public health. This course discusses the nutrient’s functions in the body and how to assess appropriate blood levels according to the latest research. Experts weigh in on whether the Recommended Dietary Allowance for highly physically active people is adequate. Learn how five school districts are offering nutritious meals to underprivileged children to keep them healthy before starting a new school year. Here’s a review of the latest evidence on dairy’s health benefits and its value in disease prevention. While women dominate the nutrition profession, more men are entering the field and experiencing great success in their careers. Experts offer tips for helping male clients get fit when time is tight. This course provides a review of these supplements and what their labels don’t necessarily say. Where There’s Smoke, Is There Fire? Learn more about this serious condition characterized by atypical signs and symptoms that often delay proper diagnosis and treatment. Experts discuss the issues and implications, and how they will affect sustainability, food insecurity, farming, and the nutrition profession. 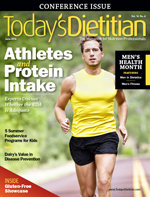 RDs speak out about whether they can be effective nutrition counselors when they’re overweight. Making and posting videos on the Web can help build your business and brand. Here’s a guide on how to get started from colleagues who already are doing it. Today’s Dietitian spoke with supermarket retailers across the country about their sustainable seafood programs and how they’re impacting the environment and consumer buying decisions. This course provides current considerations and nutritional implications of this bariatric procedure. Evidence shows long-term, healthful behavior changes are most successful when the entire family gets involved. Contrary to what some health care professionals believe, a plant-based diet can offer optimal health benefits for aging women. Today’s Dietitian spoke with dietetics and food industry experts about the pros and cons of genetically engineered foods and crops. More dietitians are offering telehealth services for convenience and to meet their clients’ changing needs. This course provides an overview of treatment options for this digestive disorder. Studies suggest these phytochemicals may help prevent cardiovascular disease and cancer and also boost cognitive function. 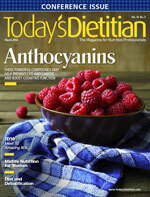 Here’s Today’s Dietitian’s fifth annual showcase of 10 amazing RDs who are making a difference. 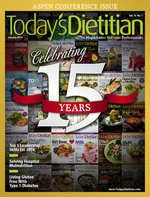 RDs can help women over the age of 40 overcome nutrition challenges. Learn how diet plays a role in the detoxification process and how dietitians specializing in integrative and functional medicine are applying the research to clinical practice. Through the personal pages of their diaries, five RDs describe the experiences that gave them a new appreciation for families who are food insecure. This course discusses a reexamination of the fiber hypothesis. Many indigenous cuisines have their roots in flavorful, nutritious plant food traditions. Inspire your clients’ plant-based eating style with meatless dishes from around the world. Learn what the research says about the most popular herbal remedies clients may be using. 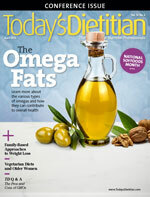 Find out how diet can improve symptoms of this crippling disease. Help older women with polycystic ovary syndrome make lasting dietary and lifestyle changes to improve their health and lower their risk of chronic disease. Nutrition plays a role in preventing illnesses promoted by inflammation. Assessing Weight Status — Is BMI the Best Tool? BMI is the standard, but many experts stress that it has limitations. Today’s Dietitian explores the latest evidence. 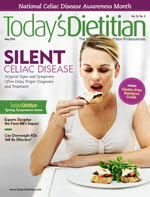 Celiac disease is common in patients with type 1 diabetes. Understand the genetic link between these conditions and ways to counsel clients. Now that health care professionals are armed with new strategies focused on an interdisciplinary team approach, malnutrition’s prevalence could decline. Mastering these top five leadership skills could help further your career and the dietetics profession now and in the years to come. Dietary factors contribute to fat accumulation in the liver, and early intervention is key to helping patients. Blood Sugar Control — Is It Just About Carb Quality?